When traveling alongside your trainer, following Pokemon will often stop to check out various things in the world depending on their given Pokemon Species. 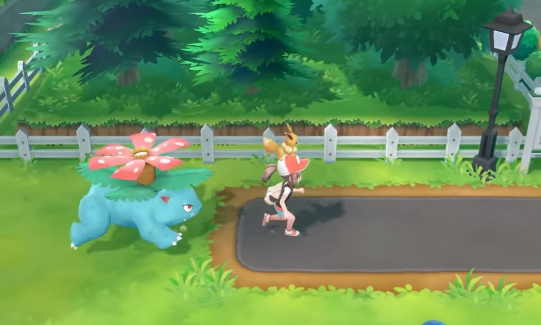 Some Pokemon will even find certain hidden Items found in both bushes and caves during your journey, which you can then obtain by interacting with them. While out of their Poke Ball, these Pokemon will gain more affection towards your trainer. The higher a Pokemon's Affection Stat is, the more likely they are to land Critical Hits in battle, avoid attacks in battle, survive certain attacks in battle with one Hit Point, and naturally remove status conditions they obtain when in battle.